Summary: Microsoft Scripting Guy, Ed Wilson, talks about using Windows PowerShell to count comments in Microsoft Word documents. I write a chapter, I send it to my editor. She looks it over for style and consistency within the series, and then she forwards it to the technical reviewer. The technical reviewer sends it back to the editor, who forwards it to the line editor. The line editor returns it to the editor who then returns it to me. I review all of the comments, make changes, accept or suggest other changes, and the process completes another iteration. The documents finally go to the publisher, who returns page proofs, and I have one final chance for correction. I turn in chapters on a regular basis, but sometimes chapters return to me in batches. When that happens, I like to know which chapters are going to require more work to review and correct stuff in the comments, and which chapters will require the least amount of work. Knowing this information can help me plan my work according to how much time I have available. In the past, that required opening each document, scrolling through to the end, and making a mental note of how many comments appear. Now I can use Windows PowerShell to do this for me. 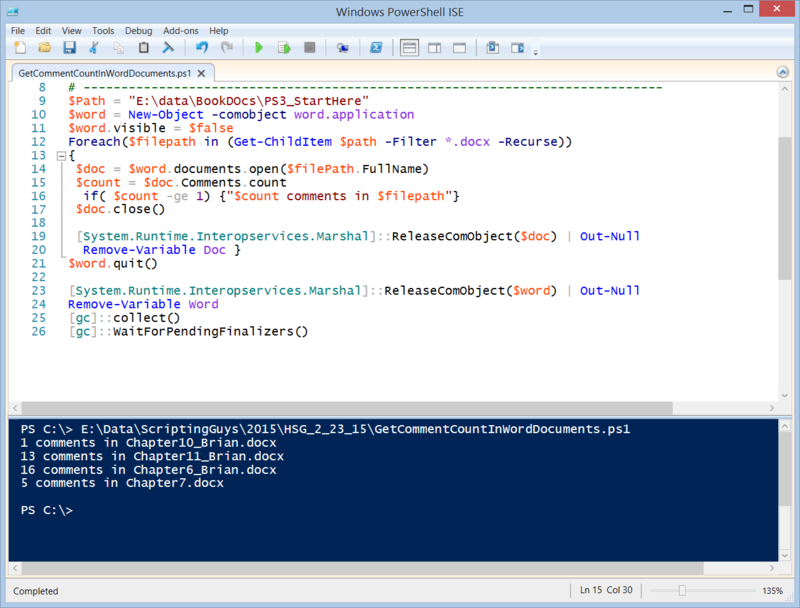 That is all there is to using Windows PowerShell to count the number of comments in a document. Join me tomorrow when I will talk about more cool stuff.